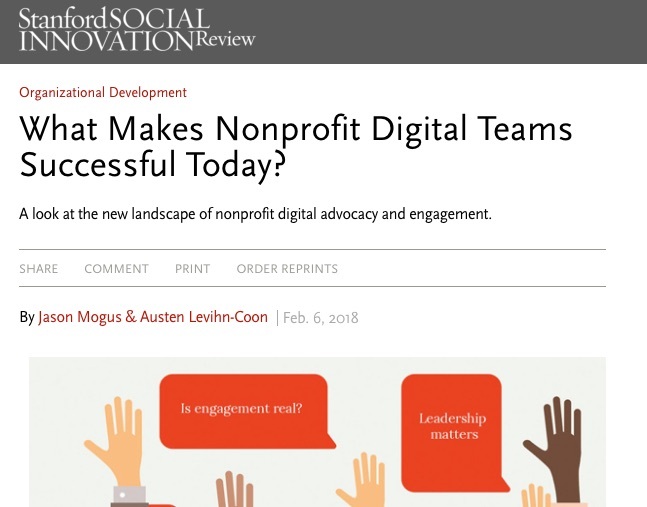 Since releasing our new Nonprofit Digital Teams 2018 report last week, it’s been downloaded hundreds of times by leaders in institutions around the world. We aimed to make it a tight package, in PPT format for easy viewing in management or team meetings. But we know you’re busy, so the Stanford Social Innovation Review just published a summary of the report’s key findings and our analysis. The practice of involving supporters more meaningfully in advocacy work beyond petitions or donations—one-way broadcast campaigns continue to dominate the way nonprofits campaign. In fact, 43 percent of respondents reported having no staff dedicated to engagement; 75 percent do not consistently track supporter engagement metrics; and 64 percent have a budget incapable of achieving their engagement goals. While a majority of respondents’ organizations now prioritize diversity in hiring and campaigning, 59 percent of digital teams reported that less than 25 percent of their team is comprised of people of color or LGBTQ people, and 34 percent have less than 10 percent diverse staff. Our report found that three-quarters of digital teams have been re-structured within the last three years—and almost a third more than once. Yet only 11 percent said the way their organization manages digital is highly effective. Half of respondents reported that their structures work “somewhat well,” leaving an unfortunate 41 percent stuck with internal structures that create significant problems or simply don’t work. A full 85 percent of respondents are now asking supporters to take real-world actions at least once a year—a proven way to make campaigning work more successful. A majority of organizations—51 percent—now offer offline actions monthly. 47 percent report adopting the “lean startup” approach of “failing fast” and data-driven decision-making, and 30 percent are adopting a “product management” approach that dedicates a highly skilled leader or team whose sole responsibility is to manage complex software and other complicated technology platforms. The article closes with our four recommendations for how digital managers and their bosses can build stronger digital programs. Answers to even more questions about our most wanted new hires, team structures, new sources of inter-departmental tension, and the characteristics of today’s most high performance digital programs, including comparisons over time, are in the full report. So why not geek out with us and get both? Ready for a distributed organizing deep dive?